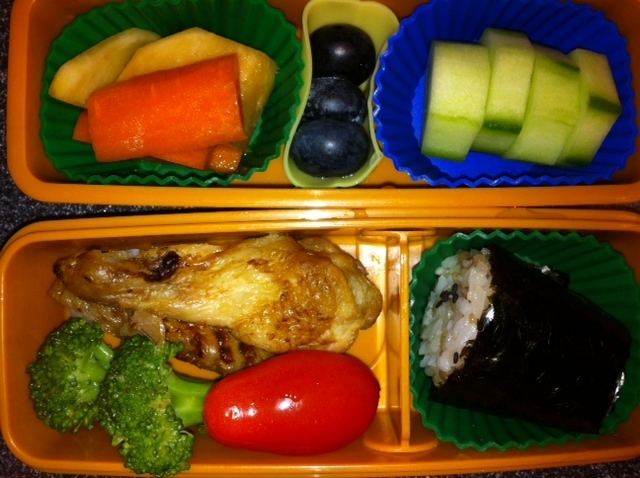 We’ll just continue this as Wednesday’s bento! Roasted chicken drumette and wingette – baked after being briefly marinated in soy sauce, mirin, lemon juice and sesame oil. Always relieved when Makinajian’s has a package of these wings! The blueberries are plump and sweet, and my little one is starting to eye them curiously. She seems to take after me – I was never adventurous eating fruit – and to this day, I’m very particular as to what kind of fruit (fresh, uncut, unsweetened) I am willing to eat. I’m of the “I’d-rather-get-my-daily-fiber-and-vitamin-intake-eating-a-tub-of-salad” girl, rather than enjoying a piece of sweet fruit. My mother-in-law always contributes a gorgeous green salad at family events for me (and me only!!) – and is entertained by the amount of greens I will consume in a sitting. Blueberries, I was speaking of, and the little one. Her favorite color is blue – “Bu-looooh!” she says, and she chooses everything blue – shirts, pants, cutlery, paper, sweets, pens, crayons… and marvels at her father’s blue eyes, the color of the sky on a clear, early summer day. “Mama, blue berries are Bu-loooh!” she says. “Yes, they are, and they are yummy,” I tell her. 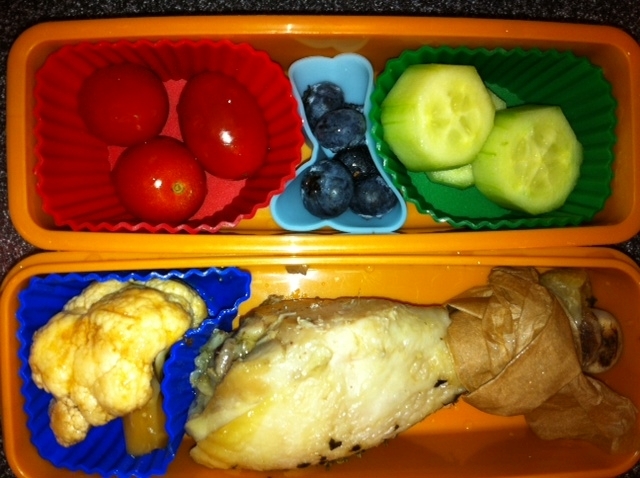 “I like them, and they were in MY bento,” my older one announces. Handed a plump, deep blue berry, she expertly popped it in her mouth. Her right cheek bulged, and her eyebrows furrowed as she concentrated on maneuvering the berry between her teeth. Her eyes opened wide, as she bit down. I realized, I did not address the issue of Kodomo no hi, or Children’s Day in my earlier entry. Traditionally, May 5th of each year celebrates the health and happiness of boys – which was subsequently changed to all children (and became a national holiday). 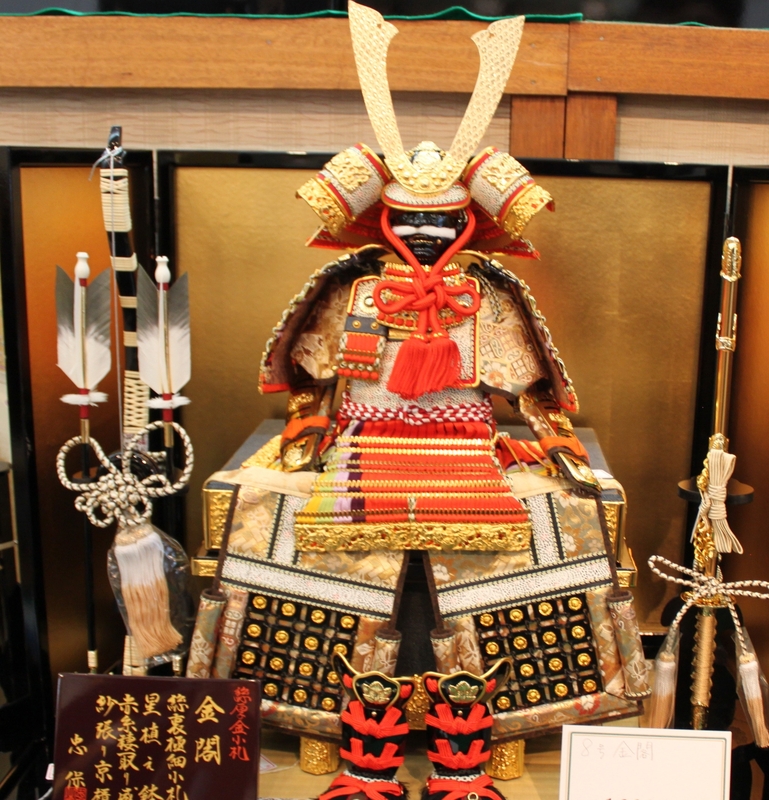 Carp streamers, or koi nobori are flown throughout Japan, and in households with boys (sons), a traditional warrior helmet, or kabuto are displayed, similar to the hinamatsuri dolls that are displayed for Girl’s Day in March. My daughter enjoyed folding kabuto with origami at Japanese school with her classmates, and they all got together under a koi nobori streamer up in display in the gymnasium, waving their own hand-made koi nobori. Baked salmon cakes, which happened to be a hit when I made them a few weeks ago. A can of salmon, two minced celery stalks, 1/2 minced onion, 1 tsp grated ginger, 2 minced scallions, one beaten egg, a palmful of black sesame seeds, 1 tbs mustard mixed well by hand, and subsequently pan-fried in a cast-iron (minimal canola oil) over medium low heat until the surface formed a crispy crust on each side. They are healthy (I include skin and bones, and mash everything together when mixing by hand), quick, and tasty even at room temperature, or straight out of the refrigerator. Pickled turnip slices – soy sauce, lemon juice, drop of mirin, grated ginger and rice vinegar for 2 – 4 days. April’s ending has brought on some gray, damp, and chilly days – and I overhead Baba say, “This weather is so similar to the tsuyu or rainy season in Japan. She was sad to see the cherry blossoms had blown away in our yard – but was happy to see the colorful azalea bushes that dot our property. The tulips that we had planted last fall grew in colorful bunches, and the girls ran between the clusters of colorful red, pink, yellow and white atop green straws and leaves. 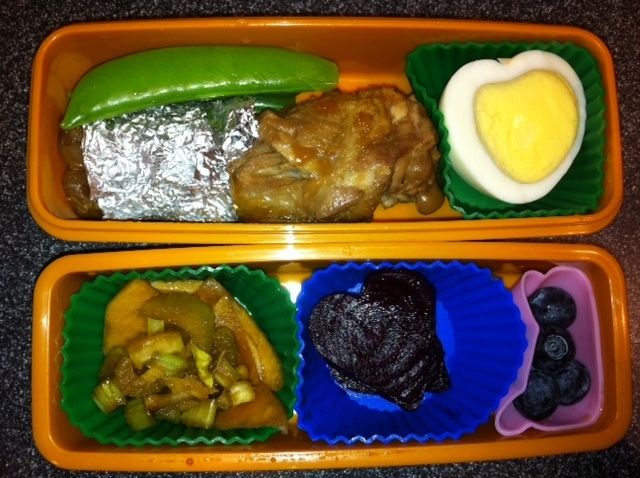 Saturday’s Japanese school bento was a quick recap of the week’s bento – roasted drumette and wingette, carrot sticks, cucumber slices, blanched sugar snap peas, pickled cauliflower, and an onigiri (Baba, my other daughter and I had these too!) with okaka filling. My daughter’s school had a wonderful fund-raiser last fall, selling various types of bulbs for planting. In previous years, I forgot to plant the bulbs before the ground froze, so I would frantically poke holes when spring arrived. The flowers bloomed, but a bit off-season. During this round, my daughter and I planted the bulbs together, heeding my green-thumb-ed co-workers’ advice of dropping several bulbs into one hole. Previous attempts at bulb planting were often spaced too far apart – little wisps of green looked more weed-like than flowers as they wearily stretched upward. Until I saw the flash of fuzzy brown and white – a smudge of long-eared fur that our dog can never keep up with. The bunnies are out. Devouring the plants… especially the lilies. Hopefully some of our plants survive – and we’ll become even more smarter, next year. Cauliflower, marinated in soy sauce, rice vinegar and sesame oil for two days. The girls love this “quick” pickle – I’ve also marinated celery and turnip slices, which are quickly devoured. I keep a jar in the fridge as often as possible – usually a used pasta sauce jar, run through the dishwasher, and then filled with the marinade and raw vegetables. Sometimes I’ll add grated or slivered fresh ginger, other times, whole or smashed garlic – these add a different flavor nuance to the mix. Works kept me busy, humming along, with various projects and tasks taking up time and energy. 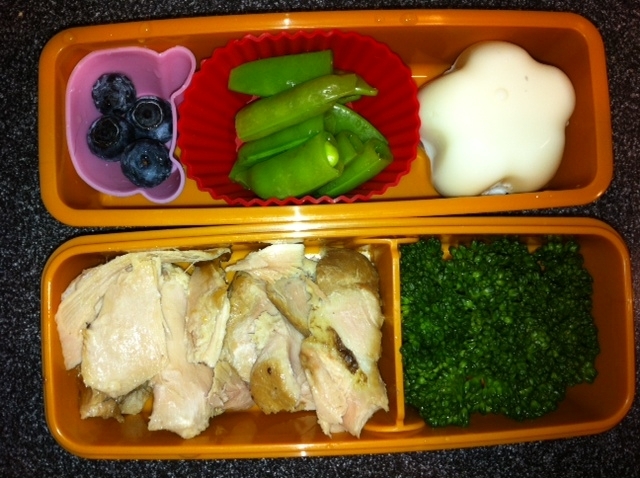 I was starting to get into the swing of things again, and I was trying to step out of the “routine” bento. Blanched sugar snap peas – I make extra and serve as a vegetable side at dinner, which both girls love… They both sit at the kitchen table peeling the two sides of the pods apart, and slo-w-ly, pick each pea out, chew carefully, and nibble down the pods. Baked chicken drumstick – marinated in soy sauce, sesame oil, rice vinegar and baked in the oven at 325 degrees until the meat is melting-ly tender, and is falling off the bone. Marinated quartered, and sliced raw turnip, and celery ribs (about 1/8 inch thick) marinated overnight in soy sauce, rice vinegar, sesame oil and grated ginger. The turnip slices – sweet, and delicate on their own, are a perfect match for the refreshing flavor of this marinade. The celery adds a subtle herby, grassiness, as well as an additional crunch – I fill a glass, Marinara sauce jar full to the top with the sliced vegetables, and add the marinade in a ratio of 1:1 for soy sauce and vinegar, 1/4 the amount for sesame oil, and a healthy size of ginger, grated in a little ceramic grater carried over from my childhood. I add the lid, and shake everything together, gently, and leave in the refrigerator, turning it upside down on occasion. The girls love this “pickle” and snack on it as they wait for dinner in the evenings. 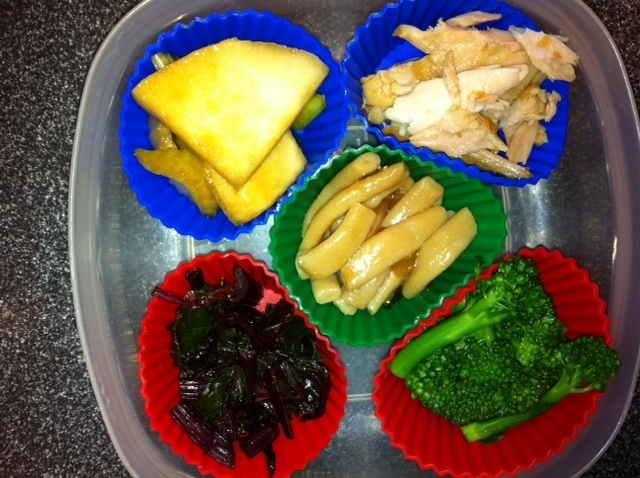 I’m still getting the hang of the new bento box – trying to gauge the appropriate amount of food can be challenging sometimes. Not to mention, with my newly injured foot, it has been a challenging trying to coordinate everything while hobbling around the house trying to keep the flow of things consistent. I laugh as I just re-read above sentence – and a scene from a recent film comes to mind. Dear reader, if you ARE familiar with the scene – my recent weeks remind me of the scene where Sophie is creeping past the mirror in her hat shop, and jumping upon seeing her reflection – and creeping past, muttering to herself that this is just a bad dream. Turnip head or not, I hope my foot heals quickly so I can return to my normal self again… soon. Spring time is almost here… ? Monday is upon us again, and the warm winter – although appreciated from a heating bill standpoint – it’s been quite uneventful without any significant snow fall (no excuse for hot chocolate and marshmallows! ), and small signs of spring in the form of tender flower shoots are popping up everywhere. Papa and I enjoyed a relaxing evening by a fire-pit after the girls continued their Girl’s Day celebration with roasted marshmallows. Tonight’s challenge is to finish cooking and storing… turkey meatballs, meat sauce or mabo-dofu… let the creative challenge begin! March arrived, stealthily, and before I knew it, was steaming full-speed ahead. My co-worker popped over, and turned my calendar to the next month. 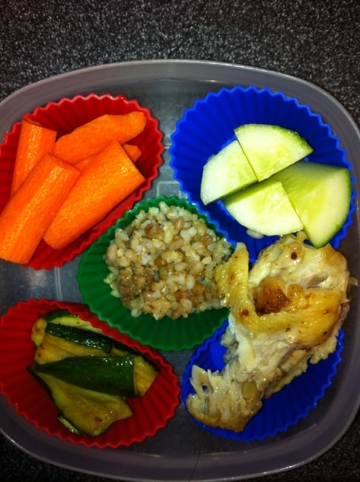 As I scrambled about, assembling my daughter’s lunch, I realized I had fallen into a routine of what she eats. Today’s lunch had a similar feel to yesterday’s – which means I have to start re-charging my bento creativity and energy again. Friday is pizza day! This is the one part of her weekly lunch routine she has no problems keeping, and as long as I pack a little fruit or vegetable sticks, I don’t feel too guilty allowing her to enjoy. Spring, spring, Where are you? New beginnings, a new day, it’s Groundhog Day?